The Costa Dorada's main city, Tarragona, has almost doubled in size during the last few decades, with its residential districts continually expanding around the beautiful medieval core. 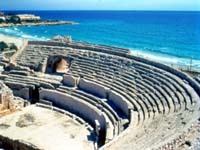 Tarragona, originally built on a rocky bluff, can trace its roots back to 218 BC, when it was founded by the ancient Romans as a legionnaires' military base. Impressive vestiges of its ancient past still remain in the form of ruins of the Roman amphitheatre, aqueduct, forum and other buildings situated on the Paseo Arqueologico (Archaeological Avenue), which leads to some panoramic viewpoints. A wide boulevard called the Rambla Nova represents the modern main street outside the old city walls. A popular outing for visitors is to explore the old harbour, known as El Serrallo, to watch the fishing boats arrive and auction their catch. As if all this wasn't enough, the city also sports some excellent beaches on its doorstep, including Playa Llarga, regarded as one of the biggest and best on the Catalonian coast. Among the many museums is an archaeological museum devoted to Roman antiquities; the Diocesan Museum displaying Gothic paintings, sculptures and tapestries; and a house museum detailing the life and career of renowned cellist, Pablo Casals.